The English coast from Beachy Head to the Isle of Wight. Minute gridlines. Scale: 1 : 112.000. Larger scale plans of Portsmouth Harbour, Shoreham, Newhaven, Littlehampton, Brighton Marina and Sovereign harbour. Tidal stream diagrams. 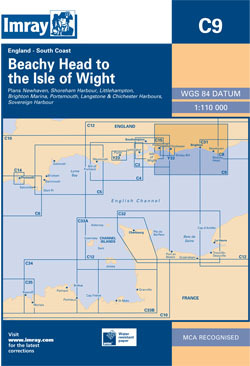 On this 2016 edition, the latest known depths have been applied throughout the chart, particularly at Shoreham Harbour, Newhaven and Sovereign Harbour.